The best thing about presents is unwrapping them. Make this simple pleasure even greater with the WhiteWall gift box. 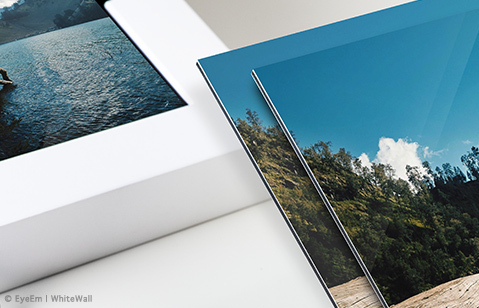 With its ingeniously simple design, it is the perfect packaging for original photo gifts with acrylic or aluminum Dibond mounting. With a personal, high-quality photo in a WhiteWall gift box, you’re actually giving them two presents in one! According to Emily Post, it’s perfectly appropriate to open gifts immediately upon receiving them. But with such a classy Gift Box, you might want to savor it for a while! 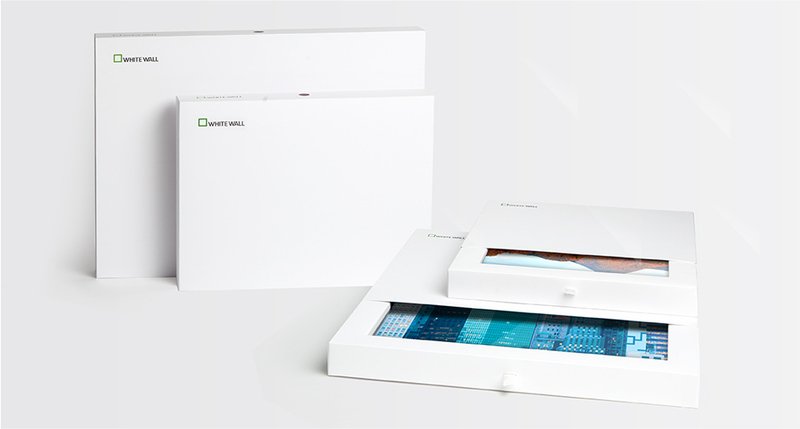 As they say, however, it’s what’s inside that really counts, and that is true here as well, whether the box holds an Original Photo Print Under Acrylic Glass or Original Photo Print On Aluminum Dibond. Acrylic glass mounting intensifies the characteristics of your photo print, making the colors really pop and adding a feeling a depth. Choose from 1/16" (2 mm), 1/8" (4 mm), or 1/4" (6 mm) acrylic glass. Do you want your acrylic glass glossy or matte, or would you prefer significantly sharper definition with our ultraHD Photo Prints? The choice is yours! Prefer to have photos mounted without glazing? Then the Original Photo Print On Aluminum Dibond is the perfect gift option for you! Your picture is mounted on a 1/8" (4 mm) thick aluminum Dibond panel that is both sturdy and light. A special UV-protective laminate ensures your photo print is long-lasting and protects against dust. The seal is available in matte or glossy. The sophisticated gift box from WhiteWall is high-quality packaging for your exclusive photo gift. Its matte, white design is elegant and timeless. Since it is a slipcase, it is easy to slide the photo out and back into the box. The WhiteWall logo on the box’s upper edge stands for the “Made in Germany" quality of the contents and the use of high-grade materials. From snapshots of funny seagulls on the beach to the special light during the magic hour, photos from vacations, atmospheric portraits, and fun photo collages make personal gifts for any occasion. 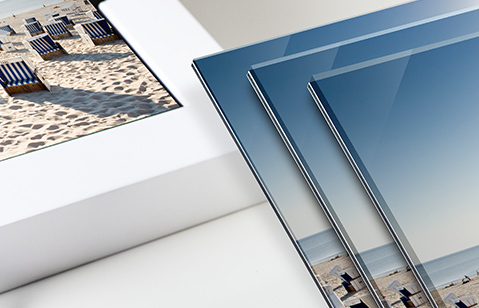 To make sure your photo gifts make a lasting impression, WhiteWall offers photo prints of the images of your choice. These are mounted under 1/16" (2 mm) of premium acrylic glass using permanently elastic silicone and reinforced with aluminum Dibond. This means you receive a long-lasting and durable product of the highest quality, one that will wow you with intense, luminous colors and depth. 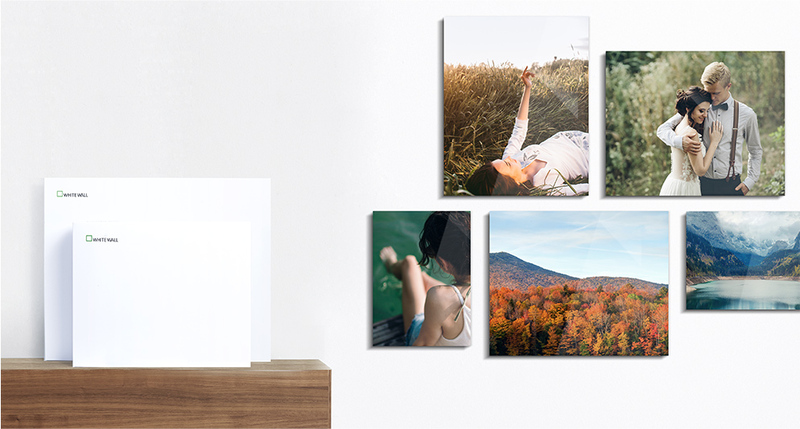 Photos under acrylic glass bring the feeling of being in a gallery into your living room. Packed in a sophisticated gift box from WhiteWall, they make exclusive gifts anyone – and not just choosy photographers – will love. Love photo gifts? Do your pictures look better with a matte finish? Then you may want to go for a true-to-the-source, brilliant print on aluminum Dibond. First, we make a real photographic print using our Durst Lambda exposure system. These are developed in a wet process, given a protective laminate, and mounted on sturdy aluminum Dibond. Finally, the prints are given a matte seal. The aluminum Dibond backing is 1/8" (4 mm) thick and is made up of two layers of aluminum. The materials used protect our products from scratching, splashes of water, and UV rays. With their low weight, photo prints on aluminum Dibond make light, long-lasting, and durable photo gifts for any occasion. Order your photo gifts on aluminum Dibond and make a winning impression with one of our timeless gift boxes. For many hobby photographers, enthusiastic vacationers, and proud parents, the search for a personal, original, and unique gift ends with a look through the photo gallery on their hard drive or telephone. For weddings, birthdays, or Valentine’s Day, photo gifts are personal presents, with which you can immortalize memories in a special way. With WhiteWall, you can select your pictures, upload and order them, all from the comfort of your own desk. With our elegant gift boxes, we delivery your photo gifts in a fitting, sophisticated, and good-looking packaging. This way, it’s not just your photos under premium acrylic or mounted on aluminum Dibond that look great – the whole experience is part of the gift.